The batteries inside a handheld flashlight expand and leak if you don't take them out shortly after they run down. If you discover the leaky batteries while they're still wet, you may be able to remove them and simply wipe off the mess. Once the battery acid dries, the batteries may get stuck inside the flashlight. The flashlight's internal parts may be damaged beyond repair if the battery acid is allowed to sit for a long period of time. Remove leaking batteries to prevent damage to your flashlight. Unscrew the flashlight's battery cover. 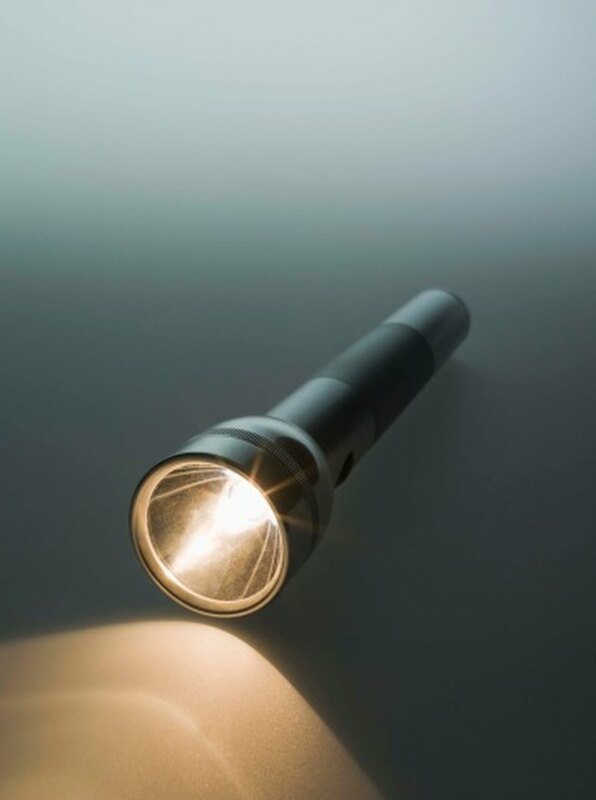 Depending on the design of your flashlight, unscrew the top or bottom cap or remove an access panel on the side of the handle. Consult your owner's manual for more specific information pertaining to your make and model. Lay a paper towel on a table or desk. Turn the flashlight upside down so the open end is over the paper towel. Dump out the old batteries and any loose material inside the flashlight body. Place the old batteries in a sealed plastic bag and dispose of them according to the environmental regulations in your area. Many cities have recycling centers designed to handle leaking batteries safely. Pull out the batteries with needle nose pliers if they're too wide to slide out of the flashlight body. If dried battery acid prevents the batteries from moving, mix baking soda and water in a small bowl to make a cleaning solution. Add two or three drops of vinegar to the mixture. Use a dropper to apply the cleaning solution to the corrosion around the batteries. Let the solution soak in for 10 to 15 minutes, and then use your pliers to try pulling the batteries out again. Scrub the corrosion off the battery contacts with an old toothbrush. Use fine-grain sandpaper to scrape off any remaining debris from the contacts. Wipe off the contacts with a soft cloth and allow them to dry before installing new batteries in the flashlight. How Do I Clean Up After an Alkaline Battery Leak?